Losar, meaning New Year, is celebrated throughout Bhutan and Tibet, and mostly any other Buddhist country. It falls around February in the Christian calendar. 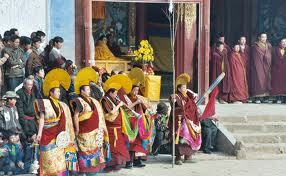 Losar is celebrated for fifteen days, most with different rituals and customs. Losar usually falls near the Chinese New Year, but don't confuse them! Losar and Chinese New Year are completely different and are celebrated differently. The first day of Losar is celebrated by drinking a customary alcoholic "beer", changkol. 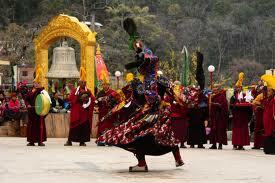 Dances are performed by monks wearing specially made costumes with tall, (usually) yellow, spreading hats.